Mydax Engineers are excited to work on new applications that challenge traditional chillers. Our technology is inherently suitable for adapting to new requirements. Customized Recirculating liquid chiller systems utilizing Mydax Advanced Temperature Control Technology 0 to 100% proportional cooling and heating control to meet individual application process cooling needs. Solutions for custom / bespoke liquid recirculating chiller prototype systems or multiple OEM applications can be provided. Mydax CU5000 Custom Chiller system. All Stainless Steel frame and panels, Watertight Nema 4 rated. Ultra precision temperature stability, low temp near cryogenic temperatures, multi channel cooling / heating, HTF fluid flow & pressure control and modular designs are all available customized to meet your specific needs. Mydax offers fully customized HMI operation software, digital and/or analog inputs/outputs, RS-232, Ethernet Lan and other communication options. Portable chillers, closed Loop chillers, multiple loop chillers, liquid to liquid recirculating heat exchangers, special shapes, sizes, colors and finishes available for each temperature contol unit (TCU). 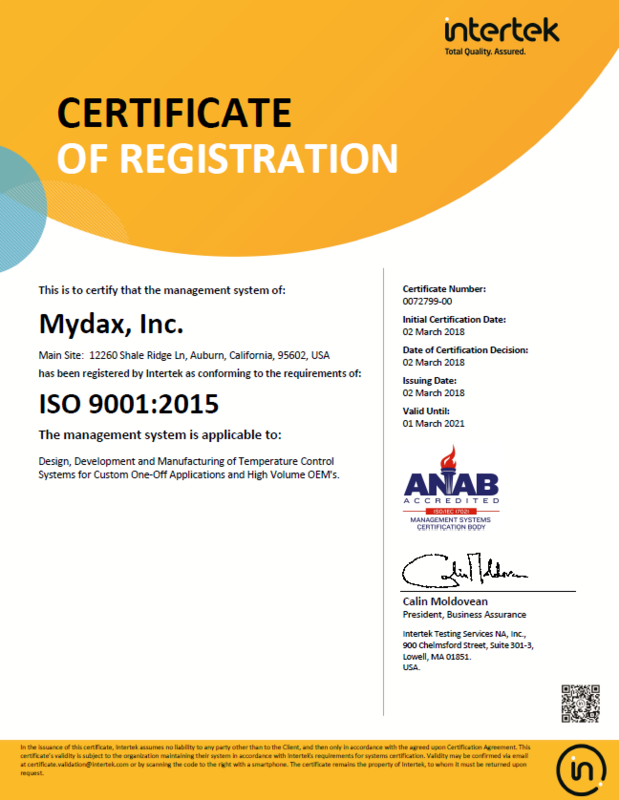 Every Mydax chiller comes with complete documentation including user’s manual and QA Test performance graphs showing system operation under your specifications. If you have a demanding chiller / heater application, please contact us. We look forward to talking with you and providing a solution to your temperature control needs.